There is no simple answer to the question “Do horses like being ridden?” Every horse is an individual, as is every rider. Whether a horse likes being ridden or not depends a great deal on the horse’s past experiences, the rider’s expertise, the horse’s health, the fit of the tack, the task at hand and much more. For these reasons, a more apt question would be “Can horses like being ridden?” The answer to that question is a resounding “Yes!” In this article, we share information that will help you establish a good relationship with your horse and a good routine so that your horse will like being ridden. Read on to learn more. 2 Does Steering Your Horse Provide A Workout? 10 How Can You Tell If Your Horse Likes Being Ridden? If you are in poor physical condition, you will be a poor rider. Of course, this caveat does not necessarily apply to therapeutic riding in which riders with disabilities ride with assistance, using specialized, adaptive equipment or to older, experienced riders on well-known and trusted mounts. The average rider needs to be able to mount up without pulling the saddle sideways and sit in the saddle in a balanced way that does not put excess strain on horse or rider. Before, or as you take up riding be sure to participate in at least 20 minutes of light-to-moderate physical exercise every day to tone your body and strengthen the muscles you need in order to ride well. Simultaneously, riding helps you attain good physical condition. Naturally horseback riding is great for your sense of balance and coordination. 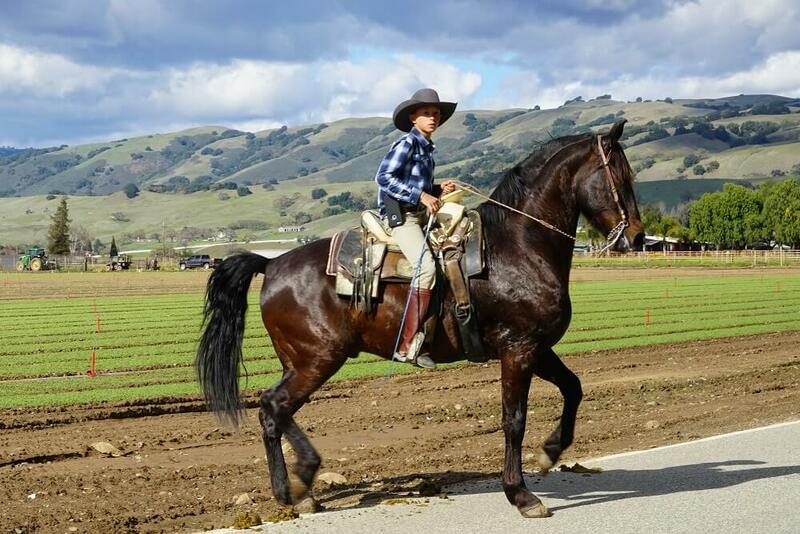 Good riding posture consists of sitting upright while maintaining flexibility and moving subtly with your horse, so maintaining good posture and a firm seat is a great core workout and toning exercise for your thighs, abdomen and your gluteus muscles. If you are a large rider, choose an appropriately large horse. When you are in fair-to-good physical condition and riding a horse who is strong enough to carry you, the horse will be more likely to enjoy being ridden. Does Steering Your Horse Provide A Workout? A horse is not a vehicle. It is a living, breathing being. You do not steer a horse: you guide a horse. If you believe your horse is a conveyance that needs steering, your horse will not enjoy being ridden. Guiding your horse should not be an upper body workout. A good rider holds the reins comfortably above the pommel or the saddlehorn and moves them subtly, in combination with body movements to convey information to the horse. If you are riding correctly, only your horse should be able to tell what you want. If you are hauling the reins around, sawing at your horse’s mouth with the bit or flapping your arms as you ride, you will be ineffective and your horse will not like being ridden. If your goal as a horseman or woman is to develop a close relationship with your horse and to be a kind and intelligent steward of another living creature, your horse will probably enjoy spending time with you and being ridden. If your goal is to use your horse only as a means of transportation, a status symbol or a money-making machine, (as shown in the video below) he surely will not. A horse who is in pain may hold his head low. If your horse’s head is hanging below the knees, you know something is wrong. While riding, a horse in pain may toss his head, grind his teeth, lay his ears back and/or swish his tail. If your horse is in pain or unwell, his level of activity may decrease. He may seem depressed. A horse in pain may “check out” and stare at the horizon. Pain may cause a horse to resist being led or moved. Horses in pain may experience loss of appetite. Lameness is always a sign of pain. Here is a good tool you can use to evaluate your horse’s pain level. The “grimace scale” was developed by researchers attempting to identify levels of pain in horses. A horse who has had a lot of bad experiences may “sour” on being ridden. A soured horse may be hard to catch. He or she may resist being bridled, act up while being saddled and walk off while being mounted. Under saddle he may lay back his ears, grind his teeth, wring his tail, try to scrape you off on a fence post or tree or simply buck you off. Souring is often caused by abuse, but it can also be caused by rider ignorance. This is why it is so important to approach your riding experience with respect and empathy and to remember that all horses are individuals and that a good rider is in relationship with a horse. It is very difficult to regain a horse’s trust after it has been soured, but it can be done. Just as all people are different, all horses are different. Different types of horses are suited to different types of riding. Choose the right type of horse and the right individual horse to suit your needs. If you try to force a horse to do work he simply cannot do, obviously he will not be happy and will not like being ridden. For example, if you want to go on leisurely trail rides, a horse bred for racing or jumping may not be the right steed for you. If you want to take up barrel racing, a draft horse is probably not what you need. Take some time to research breeds that are suited to your riding goals and then take your time to get to know the individual horses you are considering buying. This will help you make a good match between yourself, your horse and the activities you hope to pursue together. Choose the right horse for your level of skill. If you are a novice, don’t purchase a green-broke horse or a horse that’s full of fire. Have your horse examined by your vet at least once a year. Just as with people, horses who have arthritis, tooth problems, sore feet, stiff muscles, ulcers or any number of maladies will be uncomfortable and will not enjoy being active. Regular farrier visits also help ensure that your horse is comfortable while being ridden. Proper trimming, shoeing or fitting with boots protects your horses hooves and adds to comfort while riding. When dealing with a horse who seems not to enjoy being ridden, look at physical causes, faulty tack and your own riding technique to determine the cause of the problem. 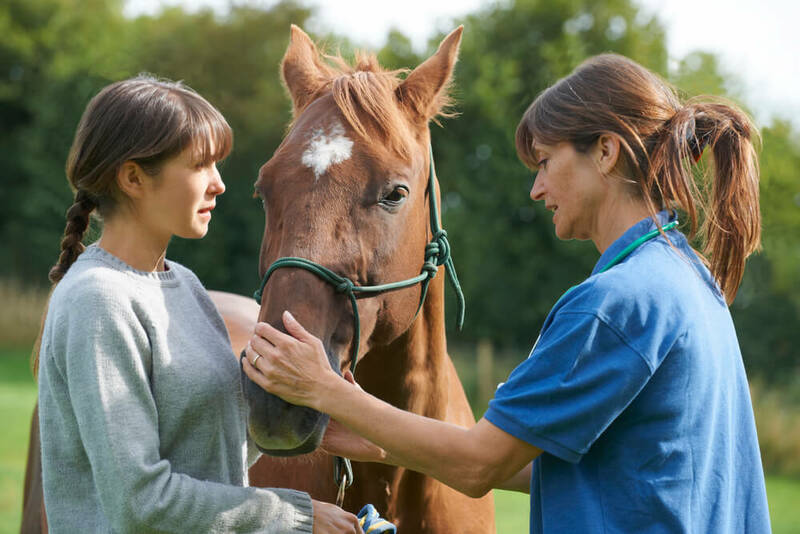 If your veterinarian rules out illness or injury as the cause of your problem, he or she may want to see your horse tacked up and observe you in the saddle to determine what the cause may be. All saddles do not fit all horses. Get the right size saddle for your horse’s back and use enough padding to protect his back from saddle sores. Be sure you know how to tack up correctly so that your horse is not bothered by rubbing and chafing from the girth and other straps. Make sure you have the right size bit for your horse’s mouth, and adjust your bridle correctly for subtle connection. If you ride like this, your horse will not enjoy it. The horse in this video is wearing improperly fitted tack and being made to run barefoot on pavement. The fact that he is running with his mouth open indicates that he is in pain. The rider bouncing around in the saddle inflicts more pain. You can bet that the horse’s hooves are being badly cracked and damaged by impact with the hard pavement. Horses want to be comfortable and secure. They want to be able to trust the people who care for them. Horses are social animals, and they like interacting with trustworthy humans who exhibit good horse sense. Set a firm foundation by providing for your horse’s needs. Friends: Your horse needs to be able to spend time with other equines or with a companion animal. Failing that, you must spend a significant amount of time with your horse every day so that he won’t be bored and lonely. Forage: Horses kept on grain alone are unhealthy and “hot”. This means they may have behavior problems caused by a diet that is just too rich. Be sure your horse has free access to good hay. Work with your vet to determine the right type and amount of grain for your horse. Freedom: A horse who stands in a stall all day is going to be unhappy and difficult to ride. Your horse needs some turnout time every day to move around freely. Be cool, calm and collected. Don’t yell at your horse or hit him. This may seem to go without saying, but many people falsely believe that punishment is the only way to train a horse. When you experience resistance from your horse, rule out all physical causes and then simply redirect your horse. This can be as simple as circling him to set off in a literal new direction. Stay quiet. Don’t wave your arms around. Don’t startle your horse. Never try to force a horse to do anything. This will just make you and the horse unhappy and may be dangerous for you. Horses are much stronger than we are. That’s why it is important to know and understand your horse, build trust and earn cooperation. If you want your horse to enjoy being ridden, you must exhibit real empathy. When you have a close relationship with your horse, he or she will enjoy spending time with you. That includes being ridden. This gentle horse probably enjoys the time he spends with his(or her) little girls. How Can You Tell If Your Horse Likes Being Ridden? Horses who look forward to going for rides make good eye contact. They prick their ears and whinny when you approach. They are easy to catch and cooperative for grooming, handling, tacking up and mounting. When you are in the saddle, a horse who likes being ridden will move out eagerly and respond well to your guidance. Spend at least twenty minutes with your horse every day. To build your horse’s trust, spend time with him other than riding. Groom your horse, take him on walks. Spend time in the barn or pasture reading a book or cleaning tack and giving your horse an opportunity to become accustomed to you. Observing your horse’s behavior when he is not under saddle is a great way to gain insight into his personality and build trust. This is especially true when you first acquire your horse and he is deciding whether or not he is in a safe new environment. Talk with your horse. It’s important that he hear and become used to the sound of your voice. Use verbal cues as well as physical cues when riding and working with him on the ground. Use the same cues consistently every time. Knowing your voice helps your horse learn to trust you, and knowing verbal cues helps him understand what you want and enjoy a successful experience with you. When your horse trusts you, he will feel safe cooperating with you and spending time with you. With that goal accomplished, going on rides can be interesting and enjoyable for you and your horse. This is a very good article for riders of all experience levels to think about. Thank you, Suzanne!